An all-in-one beginners guide to help you get started in the sport of shooting and self defense. Learn all about safety, choosing the proper ammunition, required gun gear, firearm malfunctions, and maintenance. Also covers many of the questions a new shooter needs to know about the many differences in handguns and rifles, the different parts of your gun and how to get started into the hobby of collecting. This is a must read for the novice as well as a great refresher for the experienced shooter. 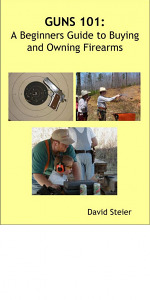 Any gun owner is sure to learn more from these pages written by David Steier, a firearms enthusiast and Instructor.